Cleaning black mold can be a big project, especially if the mold was left unnoticed for a long period of time. If you find an area in your home or business that contains black mold, it is necessary to begin an immediate black mold clean up plan in order to sanitize the area and prevent health problems. Many people view mold as an inconvenience, but they don’t realize the health implications of continued exposure. When black mold is present, your health can be negatively impacted in many ways. Long-term exposure can result in very serious health complications, sometimes even causing death. Because of the dangers of mold, it is important to follow specific instructions for your black mold clean up plan. Mold is an organism that grows and thrives in damp areas, and once it begins to grow it can infiltrate many types of building materials. Unlike dirt, mold cannot simply be wiped up with a household cleaner. When you are cleaning black mold, it is necessary to use products that will kill the organism, and also equipment to safely remove the mold from your home. Before cleaning black mold, you need to first contain the cleanup area to prevent the mold from spreading to other rooms in the building. This containment process should be done by blocking off doorways and vents with plastic sheets and duct tape, and you should also use a negative air machine to filter the spores in the air. Additionally, it is suggested that you use a face mask when entering the cleanup area in order to prevent inhalation of the mold spores. Other preventative measures include using rubber gloves, completely covering your skin, and wearing goggles to protect your eyes. Any exposure to mold can cause serious health problems, and you should avoid coming in direct contact with the mold. Mold behind kitchen cabinets from roof leak. Porous materials such as insulation, drywall, carpeting, or fabric should be discarded and replaced after the cleanup process is complete. For wood, begin cleaning black mold by spraying the moldy area with a mixture of detergent and water. This will prevent the mold spores from becoming airborne during the removal process. Then scrub the area with a wire brush to get to any additional mold that is buried within the building material. Then use a HEPA-vacuum to clean up any debris. After the wood has dried it should be encapsulated. Once the area has been cleaned, the next step for black mold clean up involves using a biocide to kill the mold spores. 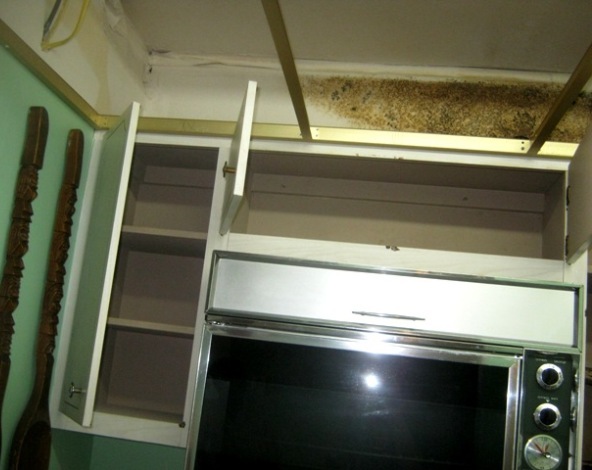 Some people mistakenly use bleach, but bleach is not effective in completely killing mold. Be sure to allow the area to completely dry before you replace any of the porous materials. If you choose to rebuild while everything is still damp, it may result in additional mold problems in the future. A dehumidifier can be used to pull moisture out of the air, and fans can be pointed at the affected area to dry it out. The job is not complete until the HVAC system has been cleaned, because it is common for mold spores to become air bound and travel through the heating or cooling system of the building. Additionally, it is always a good idea to consult with a mold specialist in order to have testing done to verify that the mold has been completely eradicated. Cleaning black mold is an intensive process, and it is best to double check to be sure that the black mold clean up effectively removed the mold spores from your home. To find a local professional to test for mold in your home, follow this link. As you can see, removing black mold is a difficult time consuming job. For that reason, as well as for safety’s sake, we recommend using a professional mold removal company. To find a mold removal company in your area, follow the link. If you prefer to do the work yourself, you can still benefit from scheduling a consultation with a professional. Most professionals offer free consultations, during which they will assess the situation, inspect your home and make sure all the mold has been located, and advise you about the best methods of mold removal for your specific situation. The information will help you if you plan to do the work yourself. Some people also choose to do part of the work themselves but hire a professional for other parts; for instance, you may feel comfortable cleaning the mold on your bathroom tiles yourself, but might prefer to hire a professional to clean out your HVAC system. New insulation being installed. Moldy insulation cannot be salvaged and must be replaced.